We generous folk here at RakeTheRake recently gave away 2 tickets to the English Poker Open Welcome Party, and now we’re giving you the chance to win 2 spectator seat packages to the EPO final! 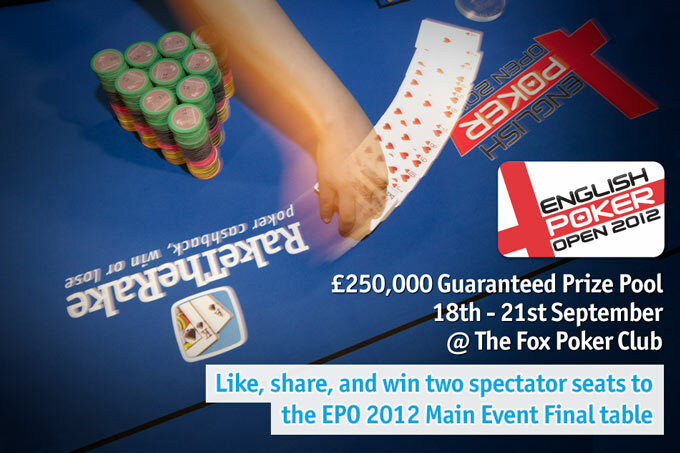 Simply visit the English Poker Open facebook page to like, share, and win! And of course spectator seats for the English Poker Open Main Event Final so you can enjoy all the action and excitement of the pinnacle of England’s biggest live poker tourney this year so far! If you’d rather take part than watch, then check out the English Poker Open website for all the information on how to enter – from straight buy-ins to qualifier routes that start with freerolls! Home » Rakeback News » Win EPO Main Event Spectator Seats with RakeTheRake!